And just like that, summer is almost over. Are you wanting to have one last hurrah or have friends visiting once more before football and cooler temps begin? If you’re anything like me, you know we have some amazing things to do here in Atlanta, but planning a weekend visit has all of a sudden become very difficult. Well, have no fear! I’ve done all of the planning for you and even tried it out with my very best friends from Ohio. It was their first visit to Atlanta, so I decided to do a mix of local favorites and tourist things. Six Feet Under in West Midtown :: Start here for drinks, an appetizer and a view. It’s low key and casual, so it’s a nice way to start the evening. Little Trouble :: Check out this trendy lounge for one more drink before dinner. Located in Westside Provisions, you can walk to your destinations for the rest of the evening! JCT Kitchen :: Eat here for a contemporary southern dinner. It has all of the comfort food favorites with an updated spin on them. Try the fried chicken and the angry mussels. Don’t forget to make reservations! Jeni’s Ice Cream :: Cool off with some tasty ice cream for desert. The line is usually pretty long for this creamy treat, but totally worth the wait! The salty caramel is a crowd favorite! Northside Tavern :: “World Famous” and has been voted one of the best dive bars in America. They feature live jazz music 7 nights a week. Anyone and everyone is welcome here. The people watching is just an added bonus! West Egg Café :: Start your morning off right at this delicious little restaurant. Serving fresh baked goodies (from their on site baker), specialty coffees (using locally roasted coffee), and southern favorites like shrimp and grits, you’re sure to love it. Top Golf :: Beat the crowds and enjoy this fun social activity right after breakfast! A favorite for people of all ages and golfing abilities! Barcelona Wine Bar at Westside Ironworks :: Have lunch at one of my absolute favorite places in Atlanta. Always good. Always. I have a few favorites that typically order (bacon wrapped dates and hanger steak) and then I usually let my server order from there. I have never been steered wrong. Monday Night Brewery :: Where the weekends are overrated. Lucky for us, they are still open on the weekend. You can take a tour of the brewery and they have corn hole outside for you to enjoy. The best part is dogs are welcome! The Vortex :: A family owned burger joint. Come here for dinner to enjoy unique décor and interestingly delicious burgers. They also serve tater tots, which is always a win. Find a local concert :: Live music is always a favorite in Atlanta. A few venues you’ll want to check out are The Tabernacle, Variety Playhouse, Eddie’s Attic, Smith’s Olde Bar, The Fox Theater, and City Winery. Flying Biscuit :: Another favorite of Atlanta natives, it will fuel you up for the day’s activities. I enjoy the “Egg-Ceptional Eggs”. And you have to get the grits and biscuits with apple butter. Just do it. 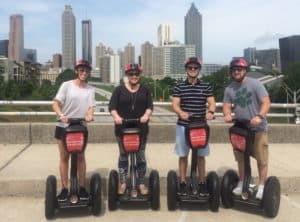 Segway Tour of Eastside Atlanta :: Fun and informative, this is the best way to see the city. I’ve done this tour twice and would seriously do it again. Take a few dollars for a King Of Pops snack at the half way point! Park Tavern :: Sit under the cabana’s to recharge after the Segway tour. Great bar food, sushi, and oysters. Get “The Good Afternoon” to drink. Afterwards, stroll Piedmont Park for a few minutes. Krog Street Market :: Your afternoon will start at one of the new hot spots. Wander around the market before departing up the Beltline to your next stop. Lady Bird :: Stop off at this outdoor-oriented bar/restaurant for a quick drink. I enjoy the “Careless Whisper”. Ponce City Market :: With food, shopping, and a rooftop park, there is something for everyone. Ecco :: A longtime favorite for dinner, this European inspired restaurant never disappoints. You must order the fried goat cheese balls. Actually, get two orders. Skyview :: I know this is uber touristy, but it’s a great way to see the city all lit up at night. Check Groupon for discounted tickets. Johnny’s Hideaway :: You simply can’t come to Atlanta without going to Johnny’s. It’s a retro nightclub with some of Atlanta’s best DJ’s spinning a mixture of oldies and today’s hits. Plus, they have live music on Sundays! Get there a little early to snag a table and avoid the usually long entrance lines. R. Thomas Deluxe Grill :: A family owned restaurant that is open 24 hours a day, this is the perfect place for a healthy late night snack. With fresh to order juices, smoothies, and free-range meats (among many other healthy options), R. Thomas caters to every type of eater. The live tropical birds are fun to see as well. I like the “bowls”. After completing this itinerary, you will know some of the hottest neighborhoods in Atlanta! So, when you need help finding your perfect home, the Peters Company can help with that too! Call us today at 678-921-1470!